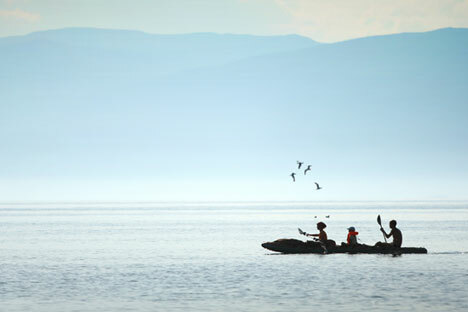 The level of Lake Baikal may reach a new record low by the end of April, which will be twice as low as this year, Alexander Frolov, the head of Rosgidromet, said. "The total inflow is decreasing, we expect it to continue decreasing. Thus, the level may be 22-30cm below the established marks by late April," Frolov told reporters on Monday. Frolov told a press conference earlier on Friday that the level of the Baikal had crossed the minimal level established by the Russian government (456 meters) two days ago. In the meantime, water levels decreased below the minimal level by a mere 12cm last year. "This year, the level went down 12cm, and next year it will decrease even more. The government is working on this issue to ensure stable functioning of the region's economy and energy," Frolov said. At the same time, he said the water levels in the deepest lake on Earth will cross the lower line and will begin rising in May. The level to which it will rise will depend on the winter, specifically, on the amount of snow. On October 9, Frolov told a meeting of the government commission in the Russian Emergency Situations Ministry that experts expect low water levels in Lake Baikal over the next 4-5 years. The amount of water coming through the dams of hydroelectric power plants is governed by Russian government regulations, including the rules for using water resources. Decisions on the amount of water passing through dams are made by the Federal Water Resources Agency. The government has decrees that the Irkutsk Hydroelectric Power Plant should work in such a way so that the water level in Lake Baikal should stay within 456-457 meters above sea level. The water intake areas in the Irkutsk region, in Angarsk and the Cheremkhovsky district depend directly on how much water will pass through the Irkutsk Hydroelectric Power Plant Irkutskenergo: if there are not enough resources, hydroelectric power plant facilities will not be able to take in water and supply cities.